The most remarkable double agent of World War II, Eddie Chapman was witty, handsome, and charming. Too bad he was also a con man, womanizer, and safe-cracker. To the British, though, he was known as ZigZag, one of MI5's most valuable agents. To the Abwehr-German military intelligence-he was known as Fritzchen (Little Fritz), and was believed to be one of their most valued and trusted spies. For three long years, Eddie played this dangerous double game, daily risking life and limb to help the Allies win the war. He was so charming that his German handler, Baron Stefan von Gröning, thought of Fritzchen as the son he never had. The Germans even awarded him the Iron Cross for spying for the Reich! They sent him to Britain, with the mission to blow up the De Havilland aircraft factory. How he and MI5 convinced the Germans that he had accomplished his mission stands as one of history's greatest acts of counterintelligence. Until now, Eddie Chapman's extraordinary double life has never been told, thwarted by the Official Secrets Act. 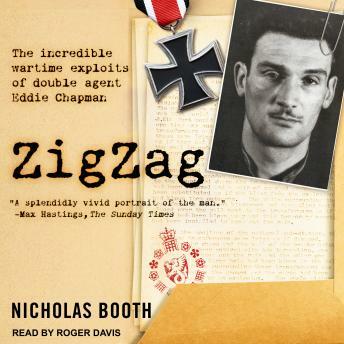 Now all the evidence-including Eddie's MI5 file-has finally been released, paving the way for Nicholas Booth's enthralling account of Eddie's long and extraordinary life.